Infidelity occurs in relationships for a variety of reasons. The length and intensity of the infidelity can also vary. Some people engage in purely physical infidelity, whereas, others may not have the opportunity to physically interact (eg. online) and therefore engage in emotional infidelity. Infidelity can take on different forms and is relevant to each individual based on an emotional connection, physical connection, or detached connection through viewing sexual content. It should be noted that viewing sexual content is not proof of infidelity as some couples use sexual content to enhance their relationship. Additionally, polyamorous relationships can also indicate consent for the inclusion of other sexual partners in the primary relationship. In this context, infidelity relies heavily on the consent, perception, and interpretation of the relationship between each partner. The impact can vary for each person. Understanding the reasons behind an act of infidelity can take some time to discover. Each individual has their own personal experience in a relationship as well as an individual belief system of what a relationship means to them. Partners of a person who has been unfaithful usually want to know why the affair occurred. Some people may be able to identify obvious reasons why they were unfaithful, however, for others who are detached from their own behaviour, this may require some effort to explore their personal beliefs and meaning behind the affair. 1. Addressing the initial impact of discovering the affair. Many facets of a couples life will be affected by the discovery of an affair including emotional wellbeing and practical measures of sharing information with children and family members where necessary. The relationship is in crisis and this has an impact on many parts of the couples life including daily activities and overall personal wellbeing. 2. Exploring antecedents to the infidelity as well as the relationship style of each partner. This process focuses on the ‘why’ and ‘how’ behind the infidelity and how each partner of the relationship see their part in how the relationship has deteriorated. This process is not designed to assign blame but instead look at the context of the relationship in which the infidelity occurred. 3. The future focuses on how the discovery of information from the previous two stages will influence the future direction of the relationship. This could result in the relationship dissolving or continuing on with further interventions for the relationship. Summary of sessions to date: John recently found out that his wife of 30 years had an affair over the course of 6 months. She had ended the affair before John found out. John only found out by accident after finding a card in his wife’s belongings that was addressed “To my friend and my lover Susan”. He confronted his wife and she confessed to the affair which had ended 4 months earlier. John and his wife have been attending couples counseling as he would like the marriage to work. As part of his own therapy, he has been attending art therapy sessions to help work through his confusion and personal pain of betrayal. 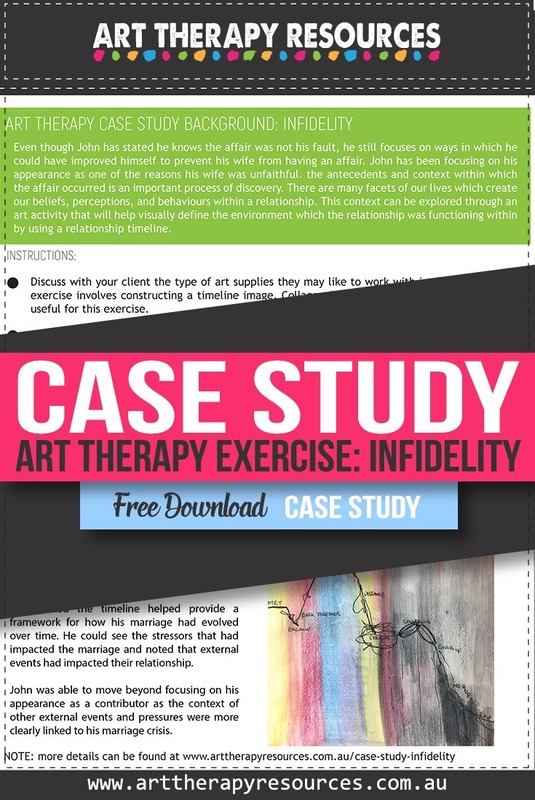 Even though John has stated he knows the affair was not his fault, he still focuses on ways in which he could have improved himself to prevent his wife from having an affair. John has been focusing on his appearance as one of the reasons his wife was unfaithful. As mentioned above in stage two of the therapeutic approach to infidelity, the antecedents and context within which the affair occurred is an important process of discovery. There are many facets of our lives which create our beliefs, perceptions, and behaviours within a relationship. This context can be explored through an art activity that will help visually define the environment which the relationship was functioning within by using a relationship timeline. 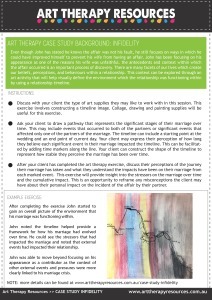 Ask your client to draw a pathway that represents the significant stages of their marriage over time. This may include events that occurred to both of the partners or significant events that affected only one of the partners of the marriage. The timeline can include a starting point at the wedding and an end point of current day. Your client may express their perception of how long they believe each significant event in their marriage impacted the timeline. This can be facilitated by adding time markers along the line. Your client can construct the shape of the timeline to represent how stable they perceive the marriage has been over time. 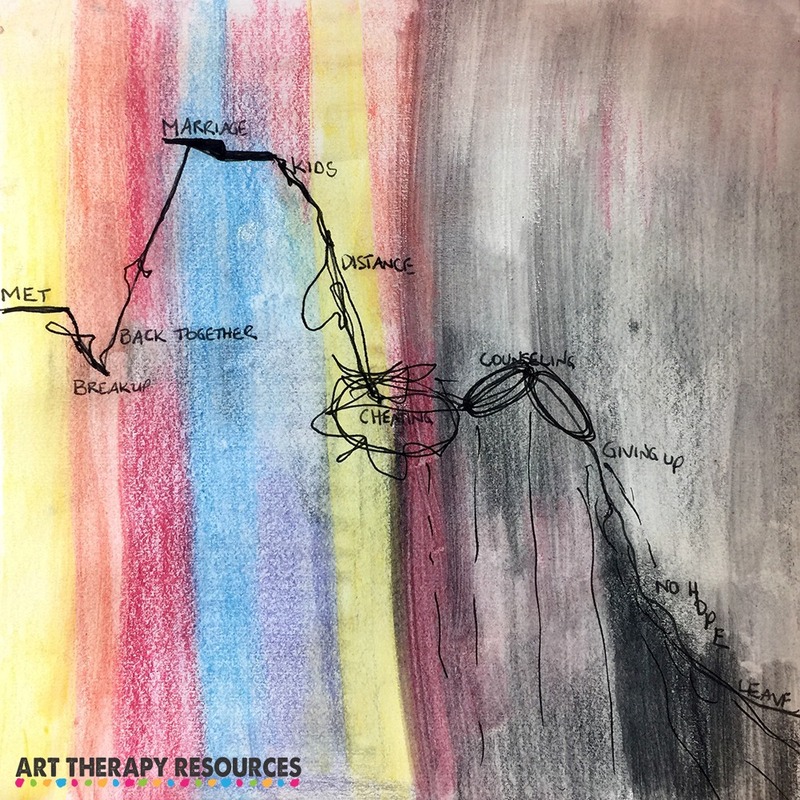 After your client has completed the art therapy exercise, discuss their perceptions of the journey their marriage has taken and what they understand the impacts have been on their marriage from each marked event. This exercise will provide insight into the stressors on the marriage over time and the cumulative impact. This is an opportunity to reframe any misconceptions the client may have about their personal impact on the incident of the affair by their partner. After completing the exercise John started to gain an overall picture of the environment that his marriage was functioning within. He noted the timeline helped provide a framework for how his marriage had evolved over time. He could see the stressors that had impacted the marriage and noted that external events had impacted their relationship. John was able to move beyond focusing on his appearance as a contributor, as the context of other external events and pressures were more clearly linked to his marriage crisis.